Alison Moyet is releasing her ninth solo record this summer ... and heading out on a tour, which includes a stop at Irving Plaza on Sept. 15. Tickets for that show went on sale today. The above video for "Situation" is from her time with Yaz (Yazoo!) from 1982. 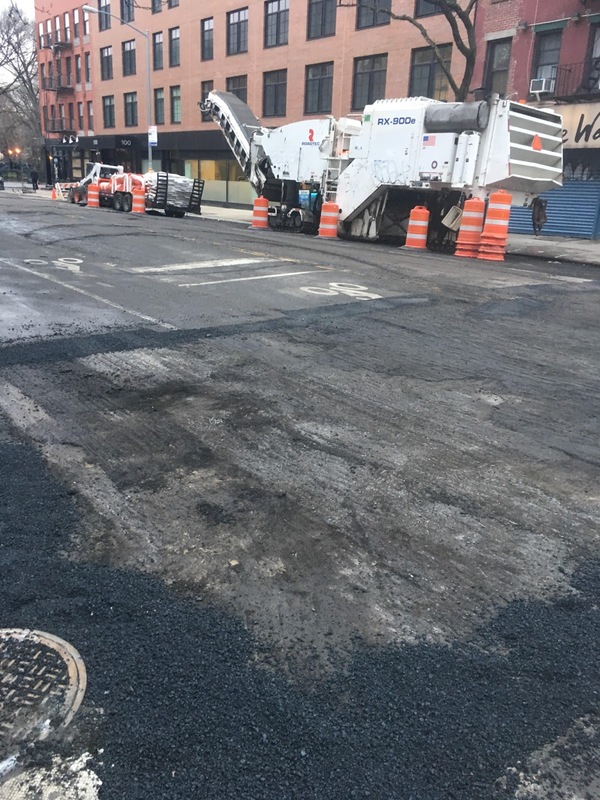 Emergency responders have been on Broadway between Union Square and 12th Street after a series of manhole explosions just after 8 this morning. No word yet on the cause. There weren't any reports of injuries either. Will update when more information becomes available. The blasts shattered the windows of the Strand Bookstore, which had not yet opened for the day, and forced the evacuation of 826 Broadway next door after eleveated carbon monoxide levels were detected, officials said. The second manhole exploded under an FDNY firetruck that had rolled up to respond to the first explosion, damaging the vehicle, officials said. The blasts were likely caused by damage from salt laid down during winter snowstorms and washed into the underground system by Friday morning’s rainstorm. Multiple manhole fires that led to evacuations and building damage Friday, likely were caused by salt used on roads during snowstorms. 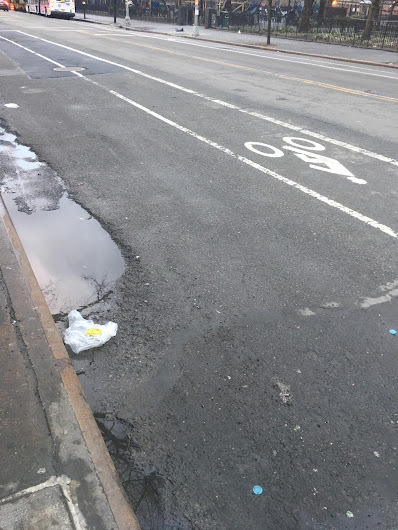 Salt laid down during winter washed into the underground system, according to the New York City Fire Department. When snow melts and mixes with salt, it can spark fires and explosions. 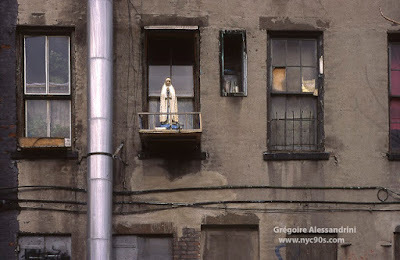 Three buildings had broken windows: 60 East 12th St., 70 East 12th St., 77 East 12th St. There was interior damage and high carbon monoxide readings in 826 Broadway, which led to evacuations. In the basement of 817 Broadway, there also were high carbon monoxide readings. There weren't any injuries reported. 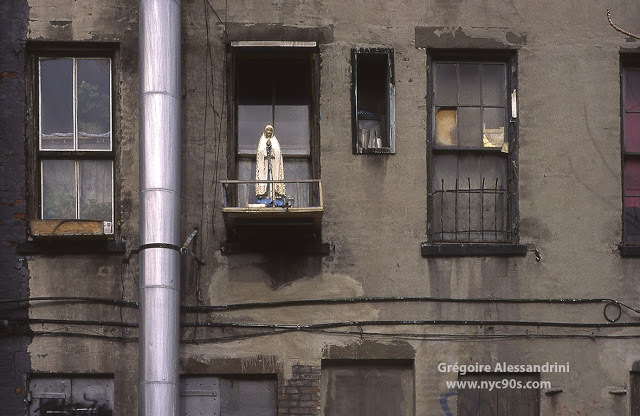 Though the years, Gregoire Alessandrini has shared some early 1990s photos of the city with us... (like here ... and here). He recently added another set to his blog — New York in the 1990's Photo Archives. 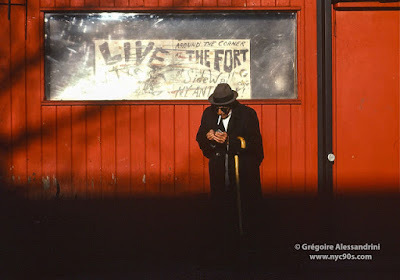 The usual background: As a student here in the early-to-mid 1990s, Alessandrini always carried a camera around with him ... and he has been uploading the photos from that time to his blog. He lives in Paris these days. 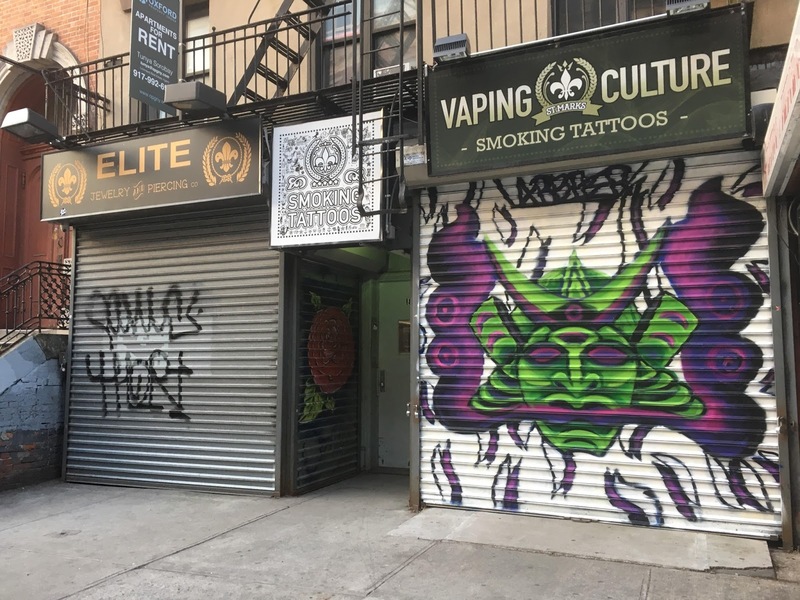 Back in the fall, an EVG reader told us a worker was upgrading the electricity at 131 Avenue A ... because he said a Starbucks was going to be renting the former Nino's and Hop Devil Grill spaces on Avenue A at St. Mark's Place. 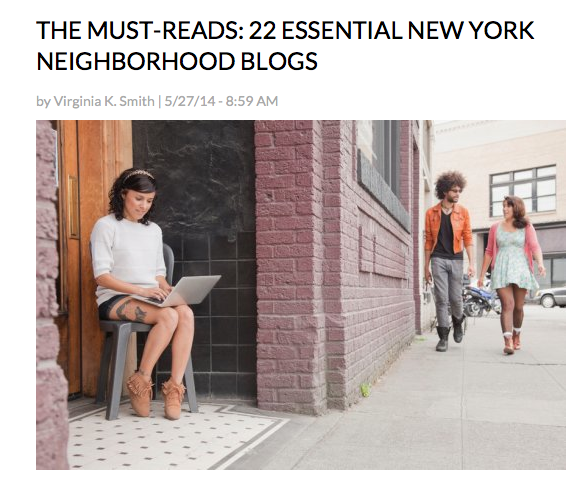 Meanwhile, last week, an Avenue A business owner asked us if we heard about a Starbucks opening on Avenue A. Now the rumor continues to pick up steam, as The Villager cites an unnamed source who tells the weekly paper: "I would say it’s a 90 percent certainty that Starbucks will be in the space." At the time, a source with knowledge of the asking rent said that the corner space was seeking $15,020 per month and the inline storefront was going for $42,072 per month. The landlord was asking $52,000 for the combined spaces. So far, there isn't any other evidence that this space has a tenant just yet. 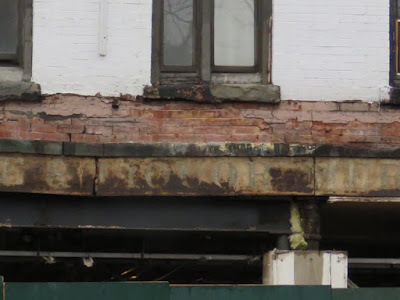 And Starbucks has been a handy rumored tenant in recent years ... for the corner of Avenue A and 11th Street and Avenue B and Fourth Street ... the contractor who said that a Starbucks was coming to First Avenue and 13th Street turned out to be correct, though. James Morrissey, who owns The Late Late on East Houston and now VNYL on Third Avenue, had been after the spaces to create The Honey Fitz, a bar-diner-restaurant-cafe-networking space. Those plans never materialized early last year. To recap, Nino's closed in October 2015. 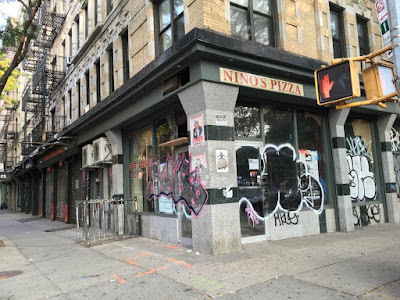 As previously reported, owner Nino Camaj accepted a low six-figure amount to walk away from his remaining 10-year lease and surrender the pizza shop that he opened in 1989. He had been in a dispute with the landlord over back rent and a closure due to a gas leak in the building. 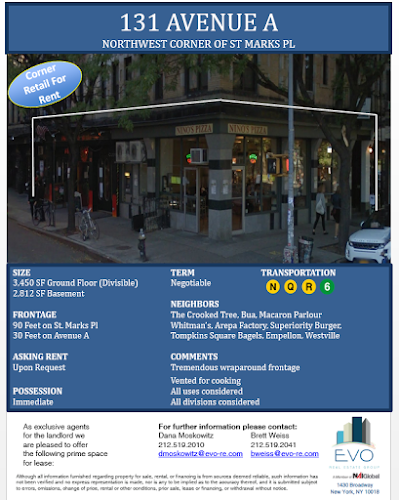 Hop Devil Grill and its sister bar next door, The Belgian Room, were seized by the state in April 2015 for nonpayment of taxes. 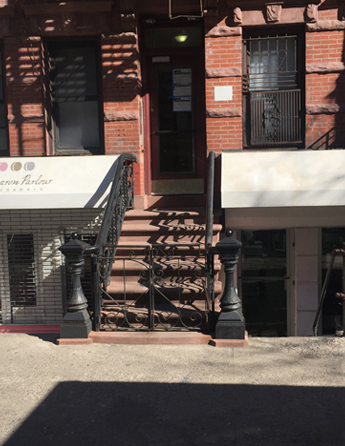 On Wednesday, Macaron Parlour closed its storefront on St. Mark's Place between Avenue A and First Avenue ahead of a move to a larger shop on the LES. 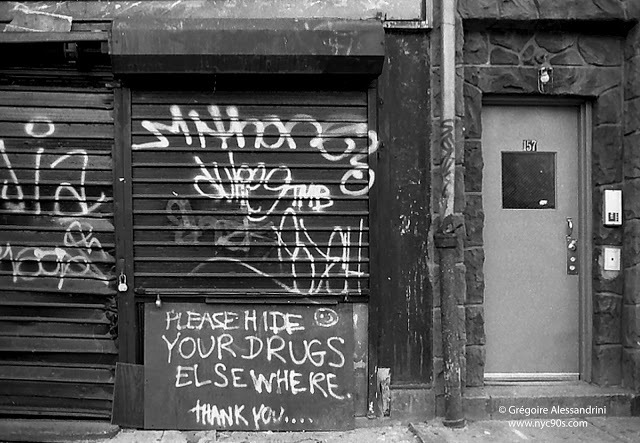 We are so pleased to announce that we are moving our East Village shop to the Lower East Side. 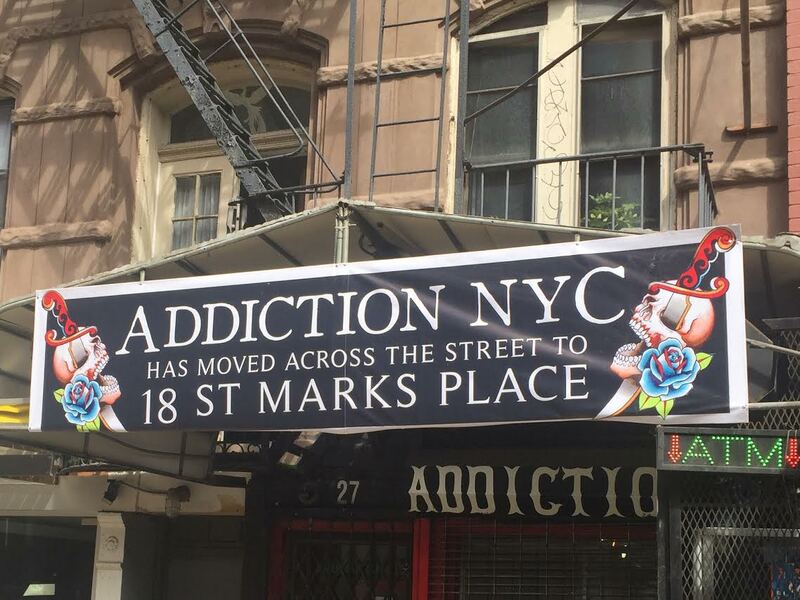 Our new address will be 44 Hester St., right beside our sister company Meow Parlour. We will be opening sometime next week (TBA) once we’ve settled in. 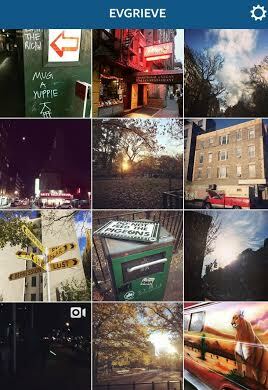 In the meantime, you can find our treats in our UWS shop or the Meow Parlour Bakery. Macaron Parlour East Village was our very first brick-and-mortar store, which we opened in October 2012. These past 4+ years have been truly amazing. What started out as just a dream has grown beyond our wildest imaginations. 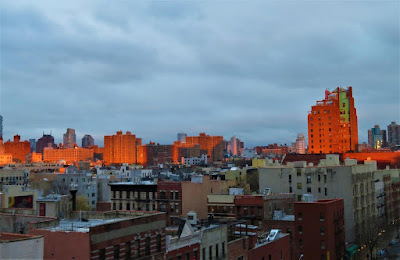 We will miss being in the East Village so, so much. We’ve simply outgrown the space and are looking forward to a bigger kitchen for production! 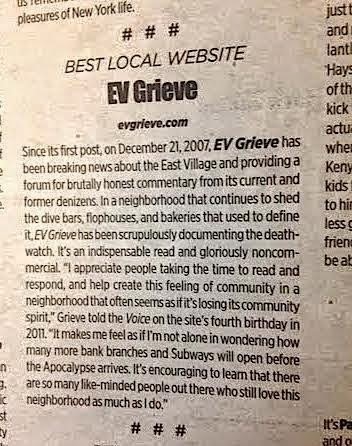 Finally, we wanted to thank our neighbors and regulars in the East Village who we have come to know and love dearly, our friends who have provided their never-ending support for us, and our customers who continue to come from near and far to try out our treats. 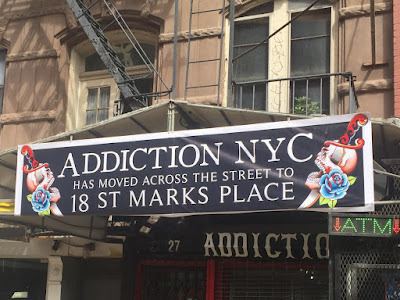 We hope you will visit us at our new location in the LES! We are excited to join the neighborhood and see what the future holds! 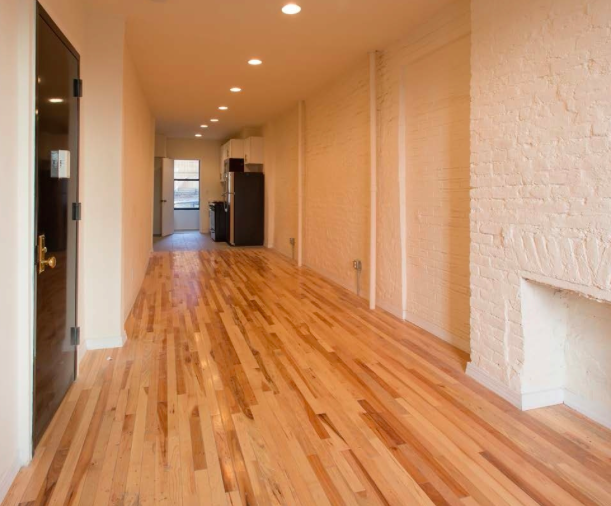 The space at 111 St. Mark's Place was previously home (briefly) to the Chocolate Library. No. 27 is one of the properties that controversial landlord Rapahel Toledano, who just filed for Chapter 11, is trying to sell. Meanwhile, the retail tenants here have received major rent increases. The Sock Man moved away (to 99 1/2 St. Mark's Place) from his longtime home in one of the spaces last January after the rent was hiked by 3x. 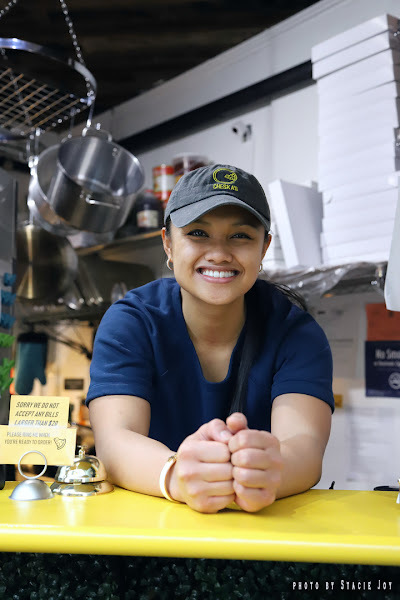 The tenant Toledano's brokers found to replace The Sock Man, the rolled ice cream shop Lab -320°, closed after six months in business. 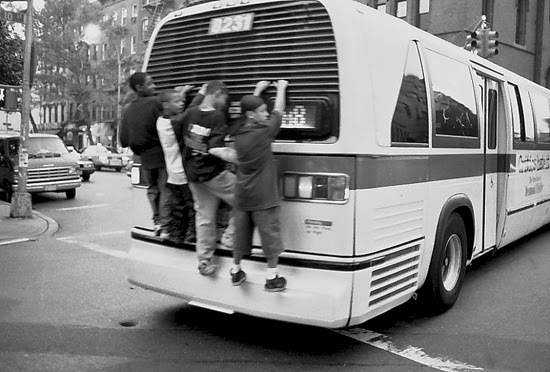 #Parkour in Tompkins Square Park... Photo early this evening by Ryan John Lee (see more of his work here ... and here). Hello, fellow gardeners! It's that time again! 6BC is seeking responsible persons interested in making a commitment to our community garden. 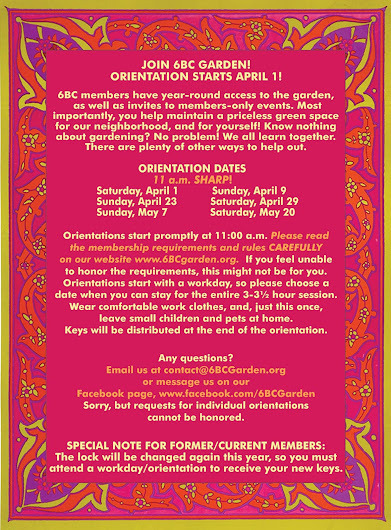 Get out in the sunshine, meet your neighbors,and help us keep this lovely space green and growing for our community. And maybe make a new friend or two! Most importantly, you will be helping to maintain a priceless, serene, green space for our neighborhood and for yourself. So you know nothing about gardening? No problem! We all learn together. You don't even have to garden — there are other ways to help out. 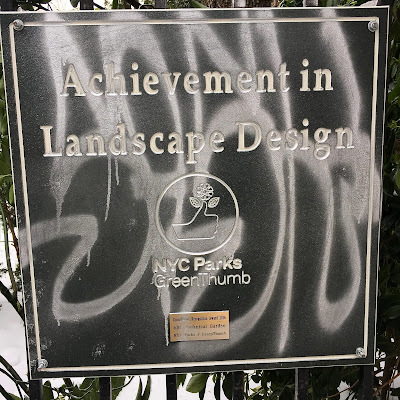 All orientations start at 11 a.m.
Last year, 6BC received the Achievement in Landscape Design in the first GreenThumb Gardeners Recognition Awards ...topping 600 other city gardens. On Tuesday, an affiliate of Raphael Toledano's Brookhill Properties filed Chapter 11 bankruptcy protection on a 15-building East Village portfolio, The Real Deal reports. Meanwhile, the deal to sell the portfolio to Joseph Sutton, son of retail mogul Jeff Sutton, for some $145 million is also off. Now that the deal with Sutton is no longer happening, Toledano is looking for other suitors, sources said. The bankruptcy filing, submitted by Brookhill-controlled entity East Village Properties LLC, would buy Toledano more time to sell the buildings and avoid foreclosure. Toledano and Sutton declined to comment. Sources familiar with the deal said that Sutton did not want to be associated with a deal tainted with a bankruptcy filing. 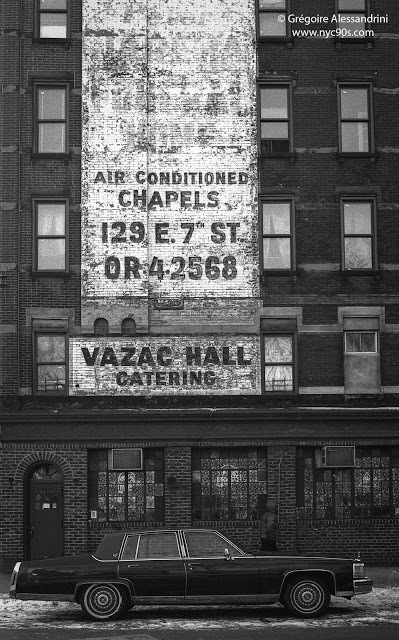 According to The Real Deal, the buildings in this portfolio are: 27 St. Mark's Place, 66 E. 7th St., 514 E. 12th St., 223 E. 5th St., 229 E. 5th St., 231 E. 5th St., 233 E. 5th St., 235 E. 5th St., 228 E. 6th St., 253 E. 10th St., 323-325 E. 12th St., 327 E. 12th St., 329 E. 12th St., 334 E. 9th St. and 510 E. 12th St. The Brookhill Properties website previously showed that the company owned 21 buildings in the East Village. Cleaning up 444 E. 13th St.
Word is circulating that Village Pourhouse, the pub-crawling hosting hotspot, is closing on Monday. A tipster told us that management informed the staff last night. However, the sports bar, which opened in the summer of 2006 on Third Avenue at East 11th Street, shouldn't be empty for too long. 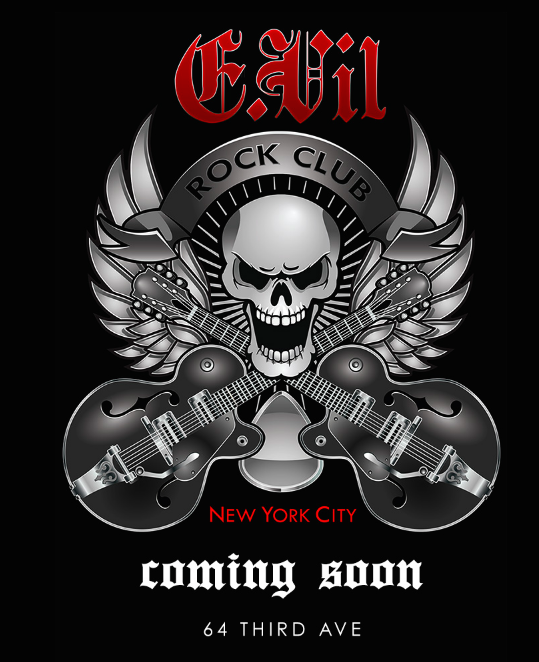 This new venture via, among other partners, club owner Richie Akiva, is "where you go to hear Aerosmith, the Clash, Guns N’ Roses, Led Zeppelin, ’80s/’90s rock, the Cult," one source told Page Six. E.Vil is expected to open on April 17, according to their Instagram account. They were not listed on the April CB3-SLA committee docket released yesterday for a new liquor license. 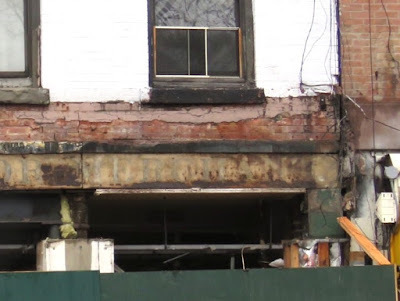 31 Third Ave. at Stuyvesant Street has been empty ever since St. Mark's Bookshop moved out in June 2014. 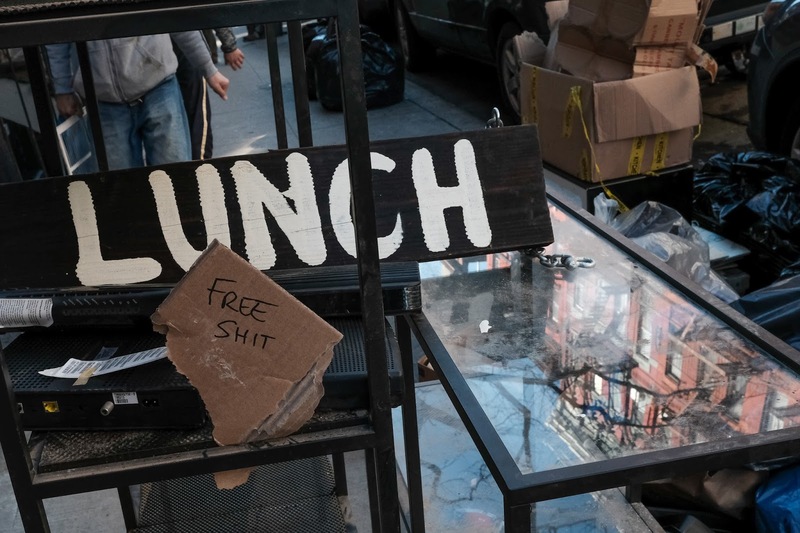 There have been a few art shows here, which makes sense given that Cooper Union owns the building. 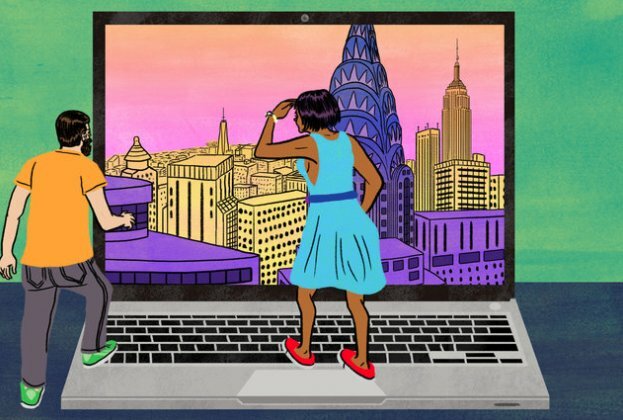 New York City residents are now able to sign up for IDNYC – a government-issued identification card that is available to all City residents age 14 and older. Immigration status does not matter. 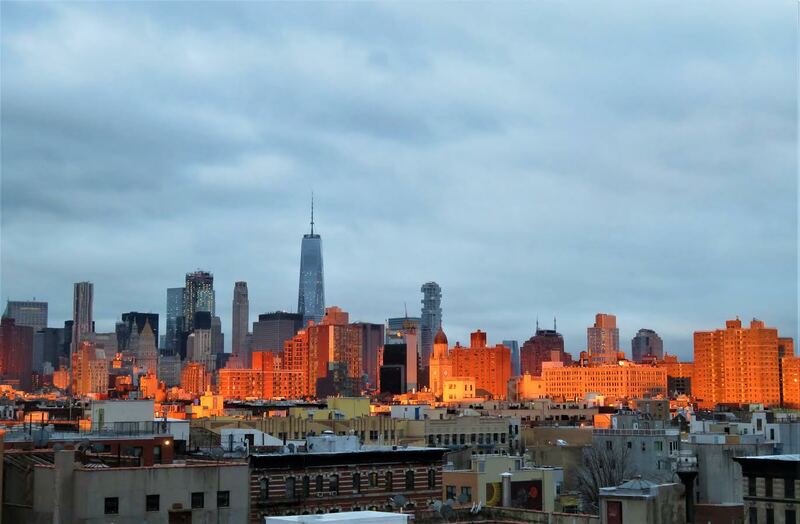 Mayor Bill de Blasio announced this initiative in his State of the City address in January 2014 and less than one year later proudly launched the largest municipal identification card program in the nation. Find more details on how to sign up here. No. 31 was home to the St. Mark's Bookshop for 22 years. Do you have an apartment with an open floor plan for 'Broad City' to use? 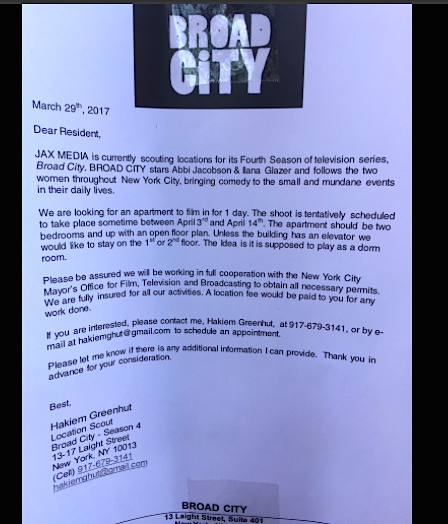 Slum Goddess shares this flyer ... Crews are out scouting locations in the East Village for season 4 of "Broad City." 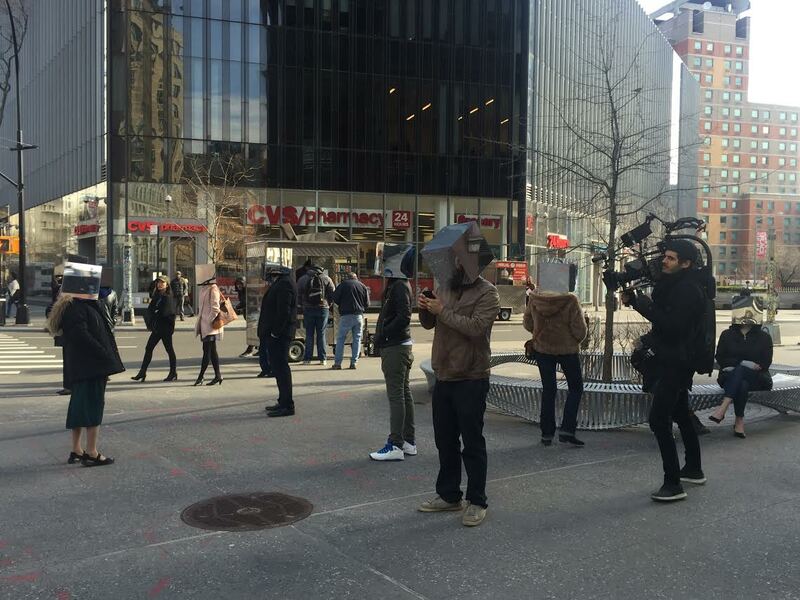 "We're looking for an apartment to film in for 1 day. The shoot is tentatively scheduled to take place sometime between April 3 and April 14. The apartment should be two bedrooms and up with an open floor plan ... The idea it is supposed to play as a dorm room. 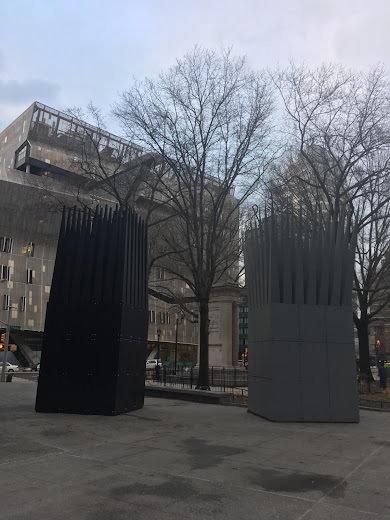 We've been noting the spiky structures under construction outside Cooper Union. Yesterday, workers finished erecting representations of John Hejduk's pair of architectural structures, "the House of the Suicide" and "the House of the Mother of the Suicide," that honor the Czech dissident Jan Palach. 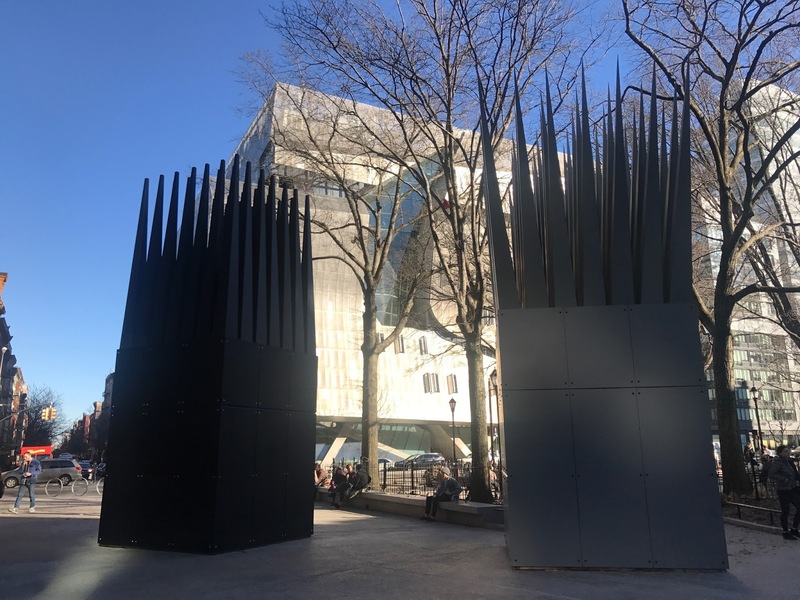 Hejduk, a Cooper Union graduate, was the founding dean of The Irwin S. Chanin School of Architecture at Cooper Union. Known as the Jan Palach Memorial, which was permanently installed in Prague in 2016, this is the first public exhibition (via Cooper Union and the Department of Transportation) for the recently revamped Cooper Square plaza. Curbed has more today about the project. 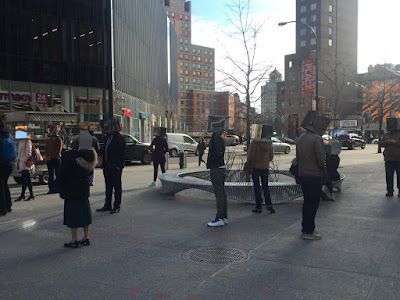 To install the outdoor sculptures ... Cooper Union assembled a team of current students and alumni. 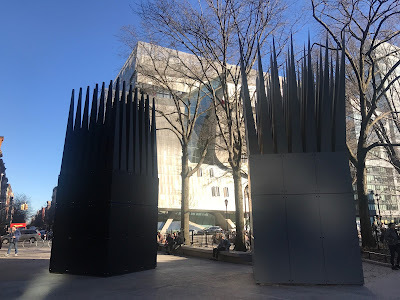 Hejduk was a big believer in the “social contract” of architecture, so the school wanted to assemble his work in that spirit. 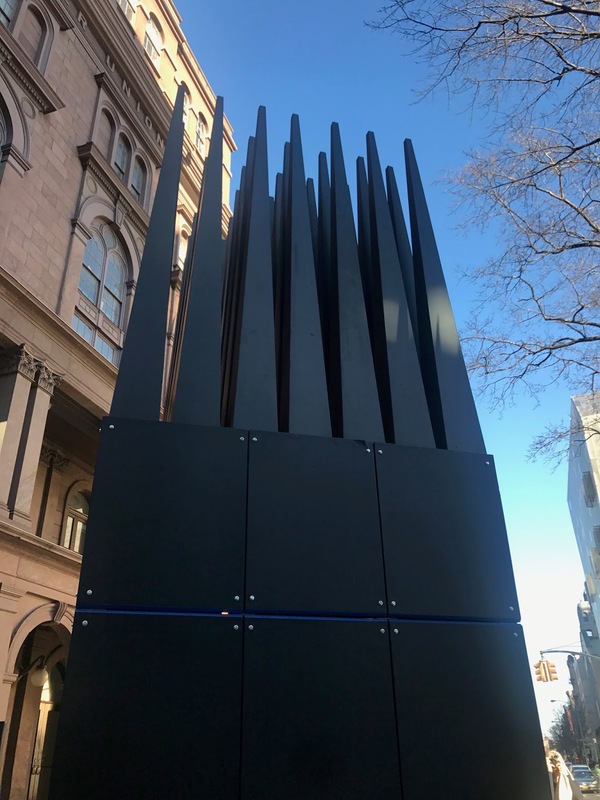 Over two weeks the Cooper Union team, using power tools and socket wrenches, assembled 400 pieces into both sculptures. They used a wooden yoke to carry each of the 98 spikes onto the roof of each structure, which is 12 feet off the ground. The spikes — which weight about 100 pounds a piece —then project another 12 feet into the air. 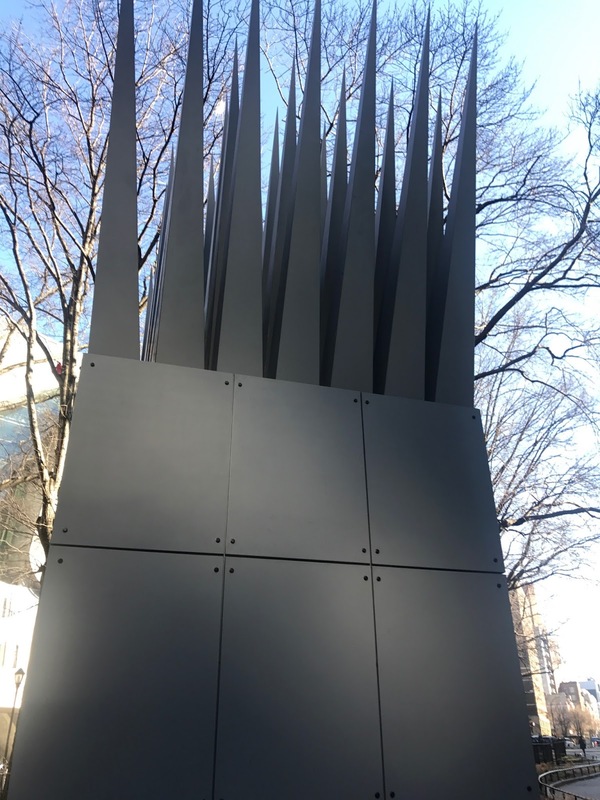 The framing of both sculptures is made of cedar timber, while the spikes are made out of sheet metal welded together. This is part of a month-long exhibit featuring Hejduk's work that starts today. The sculptures will remain through June 11. Perhaps there will be more milling tonight. Also! Signs on St. Mark's Place note that milling will take place from Third Avenue to Avenue A tonight. In the past two summers, the D.L. Cerney boutique returned to the East Village, selling its hand-made, vintage-style clothes in a pop-up space on Ninth Street between First Avenue and Second Avenue. Now, however, it appears that D.L. Cerney is making the Ninth Street stay permanent. A D.L. Cerney "open soon" sign arrived at 324 E. Ninth St. between First Avenue and Second Avenue. D.L. Cerney closed up shop on Seventh Street at the end of 2012 after 28 years in business. At the time, co-owner Linda St. John told Jeremiah Moss that the closure wasn't about rent, just about time. 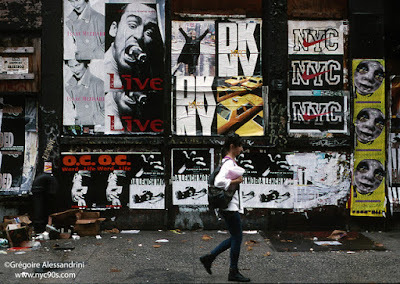 She wanted to leave the city for awhile and focus on her art and writing. There isn't any word on an opening date. The space was previously home to Dusty Buttons, which closed last month. Anyway! As for the new tenant, word from a worker here is a gelato shop. Cafe Pick Me Up moved out in May 2015 after 20 years in business. 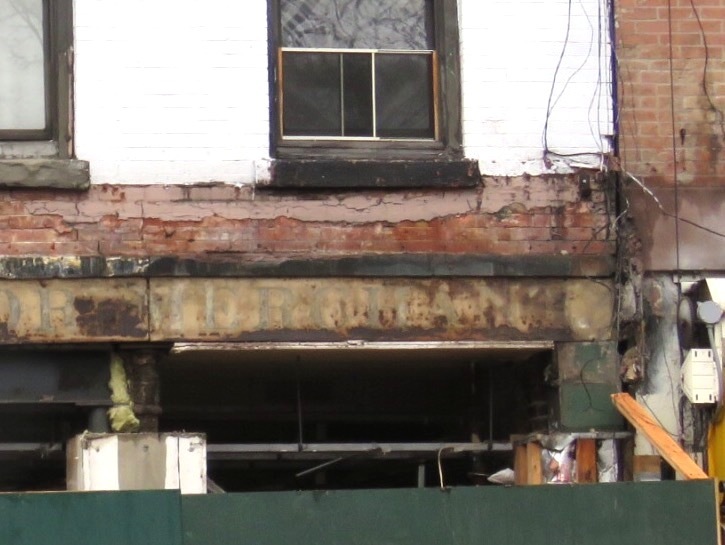 They were housed at 145 and 147 Avenue A, and had two different landlords — Icon on the left, Steve Croman on the right. 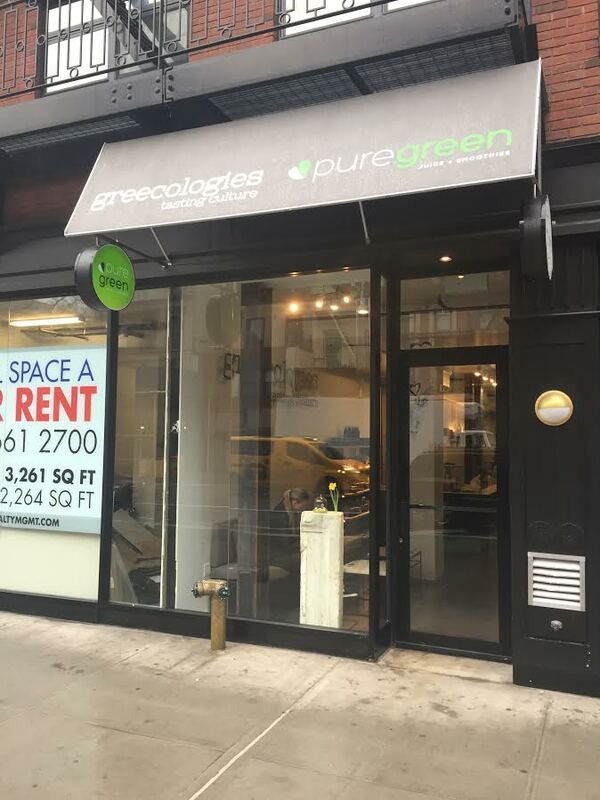 The Greecologies-Pure Green combo is now open at 152 Second Ave. between Ninth Street and 10th Street. This is the second NYC location for Greecologies, whose menu includes a variety of grass-fed yogurts as well as desserts, coffees and teas. 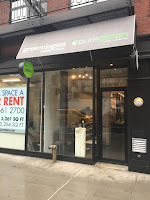 Pure Green, which has multiple NYC locations, sells cold-pressed juices, smoothies and various bowls of açaí. 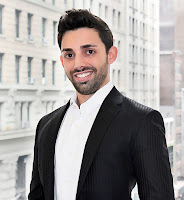 The building at 152-154 Second Ave. is the former Sigmund Schwartz Gramercy Park Chapel, which Icon Realty bought, gutted, added three extra floors and opened as luxury rentals. Space in vanilla box condition. Brick walls and wood floor. Landlord to provide C/O for retail or food. Landlord installing new storefront with large bay window. Perfect for any use. Busy 24/7 East Village block. The space is 600 square feet with an ask of $6,800. The retail space is also above the Under St. Mark's performance space. There were questions about the theater's status (they were on a month-to-month lease) when the building hit the market in 2011. However, Horse Trade Theater Group was able to secure a new 7-year lease then. Not sure what happens after 2018. According to public records, the building changed hands last summer for $6.4 million. The buyer is listed as an LLC with a law office for an address. 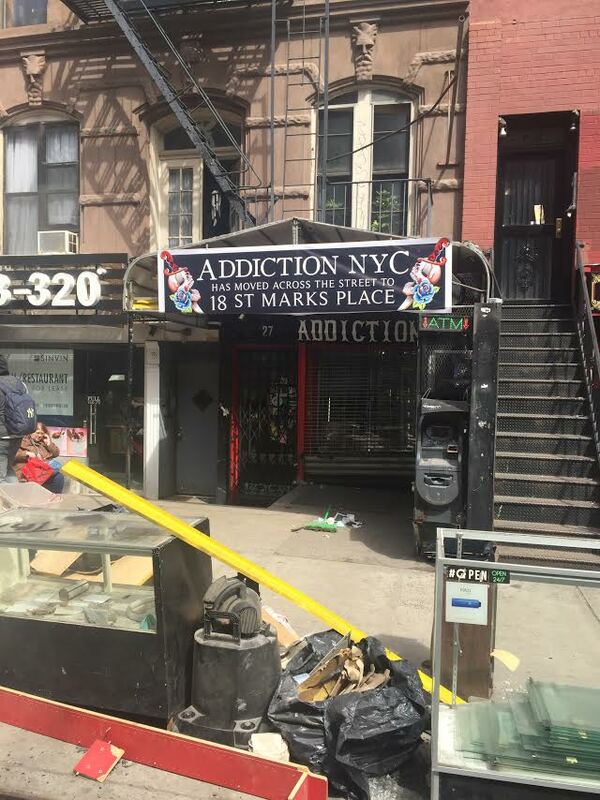 94 St. Mark's Place on the market, and what will it mean for Under St. Marks? As noted yesterday, reps for the developers of 432-438 E. 14th St. were to appear before the Board of Standards and Appeals today to seek a variance on their mixed-use building between Avenue A and First Avenue. 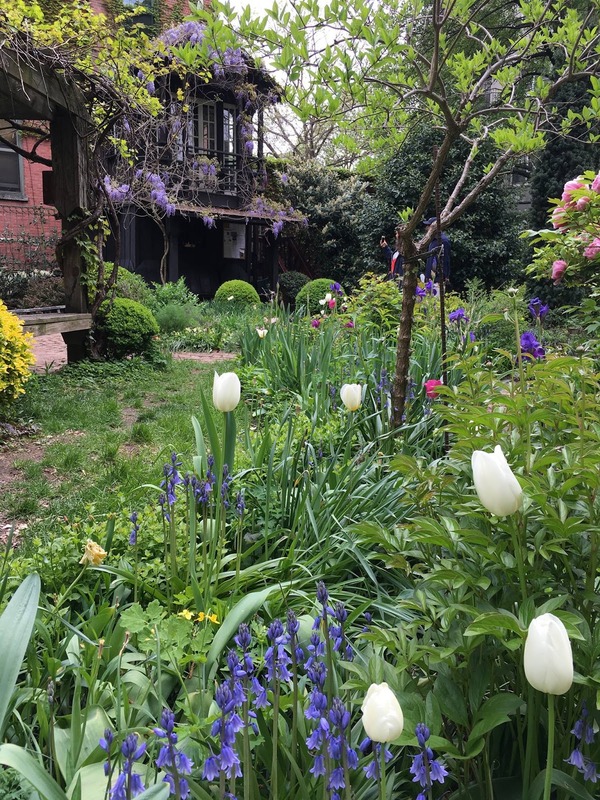 However, before this morning's hearing, Benenson Capital Partners and Mack Real Estate dropped their application for the zoning variance, according to the Greenwich Village Society for Historic Preservation (GVSHP). 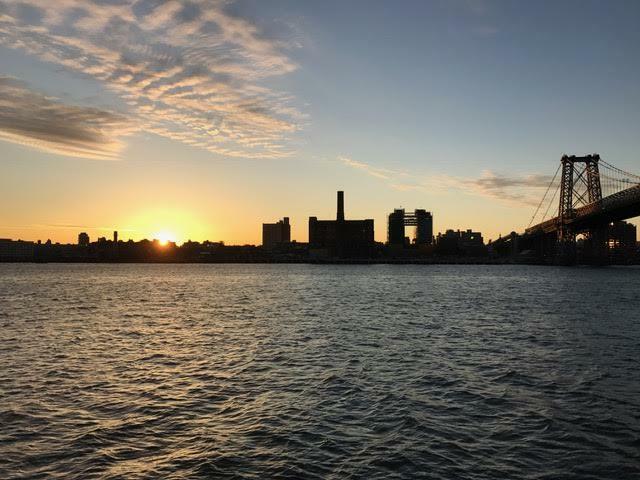 Facing opposition from community groups and residents in previous meetings, the developers cut back their request by two-thirds. Their new proposal sought nine stories on the East 14th Street side of the building, one higher than the eight allowed under the current zoning. The developers had claimed that the property "is burdened by a combination of unique conditions that result in practical difficulties in complying with the applicable zoning regulations." The GVSHP was among the groups opposed to the zoning variance. GVSHP held a rally this morning with residents and union members before the hearing was to take place. 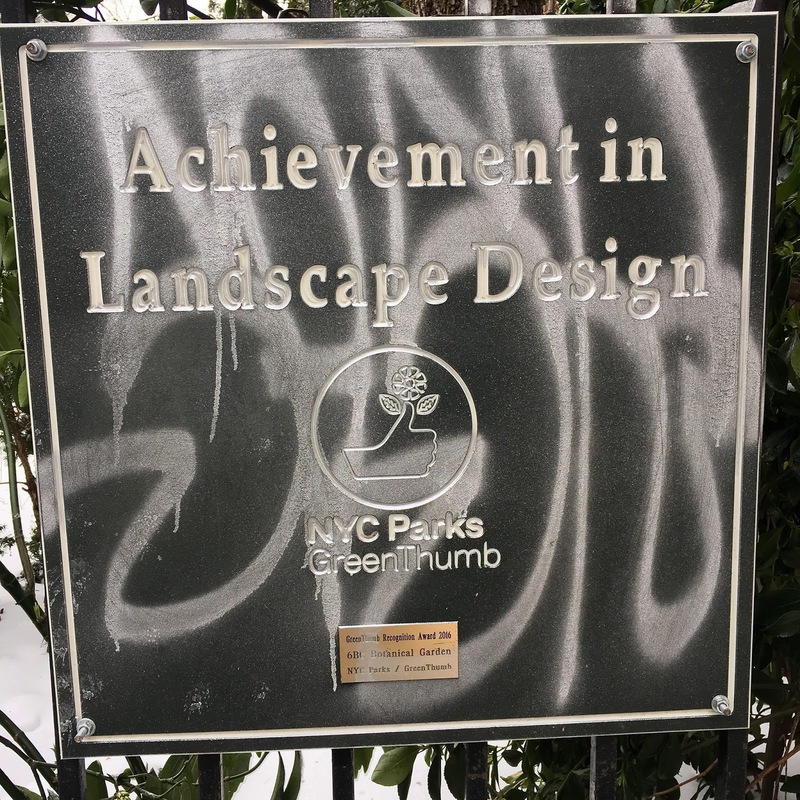 "This is a victory for the East Village and all New Yorkers who care about preserving our neighborhoods and ensuring that everyone plays by the same rules," GVSHP Executive Director Andrew Berman said in a statement. 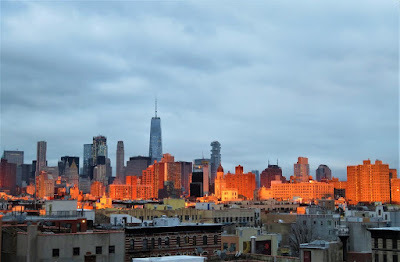 "We have reasonable parameters for the size and height of new developments in our neighborhood, which protects the East Village’s unique character. This developer showed no legal justification for being exempted from those rules." The current approved plans on file with the city show an 8-story building with 114 residences (reportedly 23 affordable, 91 market rate) and ground-floor retail. The residential entrance to the building will be on 13th Street while access to the storefronts will be on 14th Street. 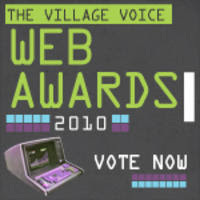 Updated: Town & Village has a recap here. Boss Hog are back with their first record in 17 years ... The Quietus has an interview with the band at 7B/Horseshoe Bar/Vazac's after practice at their nearby rehearsal space... while The New York Times also checks in with a feature here. Is this studio the East Village at its best? Make a bid on 64 2nd Ave.